Chinese rock star Cui Jian  is not likely to perform this year at China’s spring gala show due to authorities’ requirement that he censor his lyrics. There has been speculation about Cui performing at the spring gala show since the beginning of January. Cui’s agent told the New York Times  earlier this week that there’s possibility that Cui could perform if no cuts to his songs were required. The invitation to sing at the spring gala had surprised many due to his controversial role as a rock singer in China. 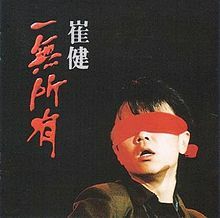 His song “Nothing to My Name” became an anthem for student protesters in Tiananmen Square in 1989. In the 1990s, the government banned his performance in big venues due to the political content of his lyrics. The Spring Festival Gala Show has been China’s most watched entertainment show as families have the traditional of watching it on Chinese New Year’s Eve. However, the show has lost its appeal among younger generations during the past few years due to its cheesy and patriotic performances and the rise of online entertainment. Many think the invitation to Cui is an attempt to revive the show. Cui’s fans have expressed mixed feelings on Chinese social media . While many think it might be a good opportunity for rock and roll to grow in China, some worry Cui’s involvement with the propaganda-style show will damage the rock and roll spirit. Cui Jian on the spring gala show means the opening up of ideology. There will be a comeback of rock and roll in 2014, the bored middle class need some stimulation from rock, powerful public opinion will push rock back into the center of entertainment. Utopia always belongs to a small minority. Once rock was accepted by the mainstream, it will be taken advantage of and controlled, just like many mainstream bands in the US. Rock eventually belongs on the playground and open air stage, so the solution is for all bands to join spring gala, or change the show directly to the Midi music festival . Cui Jian represents the times, but singing his own songs on this occasion doesn't seem suitable. Cui Jian's songs don't show warmth or compromise, they're more of a force, an elegiac, and thoughts, not something that the spring gala show can tame and control. First, Cui Jian at the spring gala show won’t have any significance for the development of rock music. The spring gala is a serious political arena, which is not suitable for rock and roll. Second, the problem with selecting songs, from being banned for a decades to the invitation to the gala show, the rebel spirit and critical force will be reduced. However, the idea of watching Cui Jian on TV is still a happy one. If Cui Jian does well on the show, it will strongly promote the self-censorship of rock bands. Speculation, compromise, and looking for the middle route will become part of Chinese rock, while the exposing, the venting, and the critical elements will stay away from rock given the reputation and interests of the [Chinese Communist] Party. Then we could only hear superficial rock rather than rock as an attitude for life. Can you imagine a group of people with long hair and leather jackets praising our country on the [China Central Television] stage?